The most amazing kids’ backpacks have to be reliable, resistant and also functional; however, it is essential that they have a fresh design and that they are easy to carry around. Roller backpacks are a solution; however, with so many different brands and models available, how can you choose the right item, without spending too much time researching? To make it easier for you, we analyzed 5 of the more popular models and reviewed them, to help you make up your mind. This highly durable yet easy to carry backpack is undoubtedly a customer’s favorite, thanks to its many features and fresh design. Made from nylon, it boasts a high-quality build and long-lasting components guaranteed to survive daily wear and tear. Two large main compartments with a padded sleeve for laptops up to 15 inches across are provided. The front utility pocket has an organizer for smaller items, while the side one can hold a bottle of water. The much capacity will not make it hard to carry around, thanks to the tuck-away shoulder straps; when on wheels, it works like carry-on luggage. Another favorite item is the Superbreak model made by JanSport. This roller backpack features specific improvements over other models of student backpacks such as a bottom skid plate for extra durability and a better organizer. It can be converted into a regular daypack by using the tuck-away shoulder straps. Made from 600 denier Polyester, this device can easily handle daily wear and tear. Its large main compartment can be used for books, laptops, notebooks and many other useful gadgets, while the front pocket is suitable for keys and cell phones. The corner mounted inline skate wheels increase stability and motion control. Carry your items with greater ease thanks to this high capacity, comfortable roller backpack for daily use. Available for an affordable price without compromising on quality, the many features of this product make it have great value for the money. Comfort is increased by the air cushioned shoulder straps used to carry it on your back. Resilience is guaranteed by the quality polyester used to manufacture it, a material which also makes it water resistant. The main compartment, two side mesh pockets and a front pocket with organizer allow you to carry more items than before. Reflective tape is included, for increased night visibility and safety. Another popular option, this stylish backpack is suitable for a wide variety of purposes, being one of the most versatile and functional products in this category. The large, multi-compartment design provides increased capacity and better organization, featuring a convenient media pocket with a headphone port. Inline skate-style corner mounted wheels offer increased stability and motion control. They are sturdy enough to survive daily wear and tear for a longer time, while still providing smooth rolling. The retractable handle and shoulder straps enable you to wear it like a backpack. The zippered compartments protect the items inside against dust and water. Reflective tape is included too. An item with excellent value for the money, the Tilami Oversized roller daypack is a desirable and quality model, suitable for many purposes. To increase durability, an armor bottom protection system was installed. Other cool features included silently rolling wheels, personalized design for shoulder straps and concealed back pockets. A wheel cover is attached to the back of this item, protecting your clothes from getting dirty when wearing the product like a regular backpack. The bearings are capable of over 30 lbs. of a load; last but not least, it features noiseless wheels made from high-density materials which also prevent damage caused by wear. The best rolling backpacks for school or work offer many advantages, and one of the most important ones seems to be the fact that they are portable and allow the person using the product to travel both easily and comfortably. Some of them are outfitted with features that enable users to lower the risk of injuries associated with carrying a backpack all of the time. One of the inconveniences of searching for cool rolling backpacks nowadays is that there are simply too many models to choose from. Some are leather backpacks, while others are made from textile fabrics that are lightweight and convenient. Which one best speaks to your needs? Whatever your preferences in terms of design, colors, the number of pockets, and the overall dimensions of the backpack, you need to make sure that it does not hurt the user’s body. This rule is particularly essential if you’re trying to purchase a teenage backpack. In this case, the person’s body is still growing, and it would be awful to affect the healthy development of the bone and muscle systems because the backpack is simply too big and heavy. In our search for a number of cool roller backpacks available for sale these days, we have focused on several details that might be of interest to you, as well. Check out our comprehensive guide if you’re having trouble finding a product that’s tailored to your needs or those of the person you’re buying the item for. Which one is best? A shoulder strap backpack or a rolling backpack? There are certain circumstances where one might be more beneficial than the other. 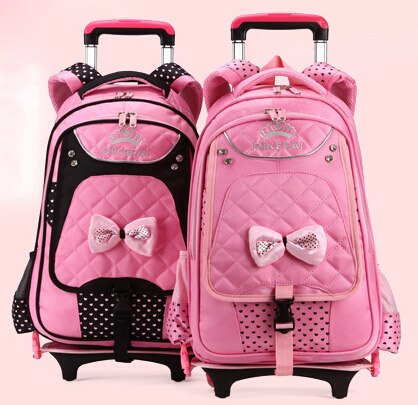 For example, the typical design of a rolling backpack involves shoulder strap, which means that its weight is naturally distributed so that the user carries it more comfortably. Of course, not all models are made the same, but the bottom line, in this case, is that if you need to carry something heavy, you need a rolling backpack, not a shoulder strap one. By contrast, the latter are usually more lightweight when compared to their rolling counterparts but this feature might be a disadvantage in some situations. For example, the fabric employed in the construction of a shoulder strap alternative might not be resilient enough so as to allow the user to carry heavy items. As we have noted above, rolling choices can be used to avoid some injuries or medical problems. How big does the product have to be? In many countries, there are educational programs focused on eliminating the need for students to carry too many books when walking to school. With most U.S. schools, this issue might be nonexistent given that most have lockers. Even so, the student has to take some books home in order to do his or her homework, so the practicality of a rolling backpack deals with it offering enough room for such items. Heavy-duty alternatives are usually made out of sturdy fabrics. While this feature makes them withstand the test of time, the problem with them is that they are heavy even without carrying any object. The idea that a product has to last a good deal of time is what dominates the minds of many modern consumers, and that’s probably due to the fact that manufacturing brands aren’t exactly concentrated on providing this advantage. After all, they have to sell more models every year, so it wouldn’t hurt if some of these backpacks became unusable. The problem is that, if the user is a teenager now, it’s very likely that he or she will grow out of the habit of using a rolling backpack at some point or the other. In fact, some people might turn to handbags, briefcases, or even mobile devices such as iPads or tablets as they are entirely capable of holding the data of hundreds of notebooks. Therefore, the ability of such a product to withstand the test of time might be less important in the long run, especially if what you are looking to do is offer it as a present to a teenager. Are you looking for something specific in design terms? Whether they are lighter or heavier, these backpacks can come in a plethora of designs. The looks of some can be rather stern while the appearance of other choices can boast vivid colors and an overall fun design that matches the user’s personality. If the backpack you are thinking of buying has to be a present for someone, you should look at his or her tastes in music, movies, and pop culture in general. This aspect is essential if you’re getting the product for someone who is young. Focus on ease of use and convenience if you are getting it for a person who is practical on all accounts. While with fishing backpacks, it’s highly likely that anglers need a good deal of compartments where they can store their gear and tackle, the same might not apply in the case of roller backpacks. It’s clear that the item needs to come with a roomy compartment where any books or personal items can find their place. Even so, extra pockets never hurt, in that the user can always store essentials like a water bottle, some tissue, several pens, as well as any other products that could come in handy at one moment or the next. As the person buying the backpack, it is your job to understand whether a superior number of pockets can make or break the deal. As usual, we always recommend that prospective buyers take the time to analyze some reviews, go through as many consumer reports as possible, and read the product description in detail so as to avoid nasty surprises after having received the backpack. There is so much information online with regard to any model that it would be bad business to avoid checking it out.